This case study explores the use of new media and online content in U.S. classrooms of higher education through an examination of the internet journal, Southern Spaces. We argue that Southern Spaces provides a forum for innovative scholarship and provides for unique teaching opportunities by taking advantage of the internet's capabilities to deliver audio, video, interactive imagery, and text in a rapid and timely fashion while also facilitating new ways of organizing, presenting, and updating research. Our case study offers a detailed overview of the philosophies behind Southern Spaces, three examples featuring Southern Spaces in the classroom and a brief discussion of pedagogical implications for the website. Over the past decade, institutions of higher education have become more technologically savvy, both in and beyond the brick-and-mortar classroom. Such institutional experiments as wireless campuses, online classrooms, instructor podcasts, network-sharing services and one-to-one computing initiatives provide instructors and students with a multitude of communication tools that are intended to better integrate instruction and learning into their lives. Adoption rates of these tools by professors have been slow but steady, and various institutions and associations have begun discussion of how publishing using new technology can work with the tenure process (Jaschik, 2006.) In addition, technology divisions at Emory University, California State University, Fullerton and Indiana State University, among others, not only offer free instructional classes for Blackboard and other course management systems, but also such incentives as stipends and computers. With the buzz surrounding these interactive technologies for teaching and learning, it should come as no surprise that in recent years, departments ranging from Computer Science to English have introduced "new media courses" to undergraduates at institutions of higher education. Marketed with tempting titles like �Cyberculture,� �Network Society,� �Digital Theory and Emerging Media,� these courses seek to educate rising scholars in multimedia literacy and interdisciplinary scholarship. These new media courses often attempt to analyze both the course subject matter and the effects of different media formats. In the hypermedia syllabi for such courses, links to assignments in new online journals engaged with issues of emergent media coexist with digitized excerpts from media studies readers, technological histories, and case studies. The resulting mix provides students with nightly readings and daily points-of-interest�most of which are available to them in cyberspace. Frequently a boundary forms between these new media explorations and more traditional classroom endeavors. Not surprisingly, course titles themselves serve as demarcations in the digital divide between born-digital content and print-based publications. Courses titled as "New Media" often deal with emergent media topically, offering a virtual free-for-all that allows students to explore everything from Google to Facebook. Conversely, classes with titles like "Introduction to American History", "Southern Literature" and "Creative Writing" tend to remain bound to print publications as online, freely available content is either not conducive or unavailable for course reading assignments. Rare exceptions, many of which have been driven by Digital History Centers at such institutions as the University of Virginia, George Mason University, University of Houston and the University of Nebraska, tend to use digitized primary source material within the classroom, but still rely primarily on the print medium to provide scholarly readings associated with their course topics�largely, because few non-print resources for such contextual materials exist. Examples like Berkeley Electronic Press, the new Rice University Press, the online journal Vectors, and numerous text-encoding initiatives point to a recent growth within the digital realm of the humanities. However, while many publishing initiatives seek to embrace the study of new media through their format and subject matter, the internet journal Southern Spaces reaches toward a somewhat different objective. 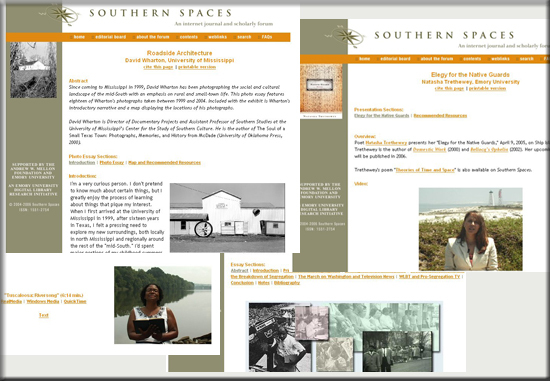 Rather than engaging with issues of new media chiefly through its topical focus, Southern Spaces works to bridge the digital divide between traditional scholarship and new media by publishing on subjects conducive to an American history or literature course, but employing many of the multimedia formats (print, audio, video, etc.) now available through the World Wide Web. In addition, the journal (hosted by Emory University�s Robert W. Woodruff Library) remains committed to digital preservation standards as well as serving multiple browsers, platforms and connection speeds. Operating with a small staff of student assistants, librarians, research faculty and collegiate instructors, this peer-reviewed internet journal offers one of the first bridges above the chasm between traditional topics of scholarly inquiry and new media applications by distributing a variety of multimedia scholarship on a range of topics relating to Southern cultural studies. This introduction to Southern Spaces discusses what this internet journal offers, why it was developed, how it has been used within the college classroom and future pedagogical implications for online scholarly communication tools. 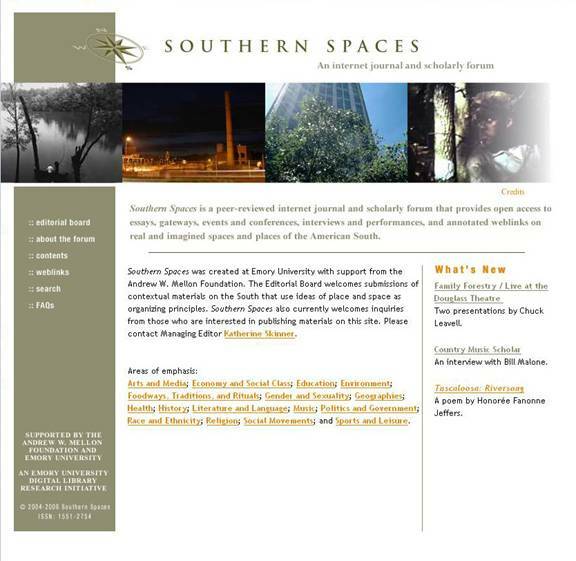 Founded in the spring of 2004, Southern Spaces is a born-digital, peer reviewed scholarly journal that explores notions of space and place in the U.S. South. Its topical focus is on the analyses of multiple souths and specific southern regions; the critical scrutiny of depictions of an imagined monolithic "South;" and the mapping of expressive cultural forms associated with place. Multimedia pieces published in this journal range from broad topical overviews parsed by southern region to detailed analyses of specific places over time. Through multimedia essays and streaming excerpts from conferences, interviews, presentations, performances and events, Southern Spaces presents work concerned with representation of spaces and places in the South, as well as work which addresses the interrelationships of southern regions and places with other places and spaces in the wider world. Unlike many peer-reviewed scholarly journals in the humanities and social sciences, Southern Spaces has no subscription fee. As an �open access� journal, it is freely available to individuals as well as institutions. Southern Spaces thus reaches a broader audience than most journals, from researchers and secondary school teachers to students, independent scholars, library patrons and the general public. Southern Spaces includes a variety of publication types, all of which share one important feature: each relies integrally on the multimedia publication environment provided by this journal. Within Southern Spaces, researchers find such content modes as �essays� (structured much like traditional articles with deep investigation of a focused topic) and �gateways� (annotated guides to particular areas of study compiled by subject experts), as well as scholarly talks, MetaCombine -style:normal">Southern Studies faculty and students that encompassed new search and retrieval methods as well as new forms of digital scholarship. The Advisory Board of this project became the journal�s founding Editorial Board. They determined that the digital medium offered as yet untapped potential for peer-reviewed scholarly publishing. With this journal, they sought to pioneer a new model for academic publishing in the humanities. Even such well respected and exclusively web-based journals as Postmodern Culture had thus far published only text-based pieces�articles that could have been produced in the print medium. Southern Spaces distinguished itself by publishing scholarly works that depended upon a multimedia environment, not by using the internet as a dissemination medium for text-based scholarship. As they began planning the journal�s structure, the Editorial Board determined that the success of a new model for digital publication would require two major accomplishments. First, the model would need to resolve several major barriers to adoption of the digital framework for scholarly work, including publishing its contents in a permanently citable location. Second, it would need to promote a fusion of multimedia elements, including interactive maps, images, sound and video files, and data sets, into the scholarly productions such that these became integral parts of the publication, not mere auxiliary materials. At its inaugural meeting in 2004, the Editorial Board established several key policies and procedures for the journal. With regard to barriers to adoption, they carefully approached four key issues: copyright, citation, version control, and cataloging. They created a copyright statement that favored the rights of the author, granting only first publication rights to the forum. By providing authors with explicit rights to republish their materials elsewhere, the Board sought to embody the principles of �open access� and �open content� publications. This is unusual within scholarly publishing, as most publishers claim that the ownership of published material resides with the publisher, not the author. Further, this move anticipated the conundrum of tenure review that has plagued digital publications. As most tenure review boards do not yet consider digital publications�even peer-reviewed journal articles�in the same light as peer-reviewed print scholarship, many scholars are unwilling to risk publishing in this medium. By providing scholars with the right to republish their materials elsewhere, the Editorial Board hoped to allay the fears of this significant community of tenure-seeking scholars. The Editorial Board likewise addressed the barrier of citation. Scholars and independent researchers have reported their reluctance to cite Internet-based resources due to the ephemeral nature of these resources. Many digitally published websites change their content at-will without alerting readers of the changes, move locations or Uniform Resource Locators (URLs) repeatedly, and a large number of sites disappear altogether without warning. As a result, citing web pages often yields frustration, both for authors and readers of their work. The cited content may change after a scholar has cited it; it may move to a different location; or it may vanish altogether, leaving the author and her/his readers in unverifiable terrain. The Board elicited the support of the Robert. W. Woodruff Library at Emory University , the website�s host, to provide stable URLs for the site�s content. All Southern Spaces publications are given a standard URL that encodes key information about the piece, including the author�s name and the publication year. These URLs do not change; nor does the content listed at each page. The Library has made a commitment to maintaining this content in its current locations ad infinitum. Information regarding this policy is relayed to the reader through the website on a �Cite This Page� link that appears on every publication page. This citation policy relates to a third issue addressed by the Editorial Board in 2004: that of version control. In the print medium, it is not possible to make changes to a publication unless the publisher is willing to print a new edition. As such, authors cannot add to, subtract from, or even correct typos from their work after it appears�not because doing so is undesirable, but because it is too costly. One of the chief benefits of publishing within the digital medium is that the cost of changing a word, a link, an image, or any other component of a site is negligible. If an author comes across new information relevant to a previous web-based publication, s/he can even add this information to the existing piece, and in doing so, enrich its scholarly value. The Editorial Board wanted to capitalize on this feature of digital publishing, but wanted to do so in such a way that every change is transparent to the reader, and every version of a piece is accessible through its original citation (or URL). The Board thus established procedures for amendments to published works, and determined that such amendments could not be made to the original piece, but would instead be made within a new version of that piece. The original piece remains at its published URL�no changes can be made to that piece in order to ensure that the content matches any citation a reader may include in her/his own work. New versions are given clearly identifiable URLs that connect it to the original publication without replacing it. Likewise, every publication that contains versions also contains a version-management page that links to every published version of the piece, and that provides a �tracked-changes� option to enable readers to quickly identify what changes were made between each version. This maintains both the permanence of content expected by researchers and the flexibility of the medium for published authors. Finally, the Board broached the issue of cataloging published essays, gateways, and other Southern Spaces formats. Libraries have long cataloged scholarly journals; however, they have done so by issue, not by individual publication. The convention of issue-based publication was constructed in order to allow newspapers, magazines, journals and other periodicals to publish batches of works at particular temporal moments�a cost-saving mechanism in the print medium. Such a convention does not naturally apply to the digital medium, where publication can occur on a rolling basis without incurring additional cost. Given that another asset of the digital medium is the relatively quick turn-around time from submission to publication, releasing pieces on a rolling basis is a highly desirable quality for a Web-based journal. Southern Spaces adopted a policy of publishing content on a rolling basis, but needed a way to catalog contents to make them more visible through library catalogs and other indices of published works. The Editorial Board charged the Managing Editor and Editorial Associates with resolving this issue. Working in tandem with the Woodruff Library�s Technology and Metadata Librarian, the Managing Editor and Editorial Staff created a cataloging format based on a current library standard, MODS (Metadata Object Description Schema), to catalog the journal�s contents at the publication level. Each essay, gateway, interview, performance, and presentation published in Southern Spaces is provided with a full catalog record. This record is stored in the code of the lead html-encoded page of the published piece and is submitted to relevant indices, including Emory University �s library catalog. With these important policies and procedures established, the Editorial Board next concentrated on the critical feature that distinguished Southern Spaces from other digital journals�its focus on publishing works that cannot be published in print. The Board wrote a call for submissions and submission guidelines that explicitly sought scholarship that fully integrated text and multimedia elements. The Board and staff have worked collaboratively with authors since the release of that call in order to fulfill this mission. � William G. Thomas III�s �Television News and the Civil Rights Struggle: The Views in Virginia and Mississippi,� which documents the difference in journalistic responses to the Civil Rights Movement in particular places (Virginia, Mississippi) and spaces (print, television). He demonstrates with archival images and television footage that local television news broadcasts in Virginia in the fifties began to address the segregation issue in ways substantially more balanced and desegregated than the print media, while a major television station in Jackson , Mississippi , worked hard to defend segregation and deny access to opposing voices, both local and national. � Virtual poems by Minnie Bruce Pratt, Natasha Trethewey, and Honor�e Fannone Jeffers provide readers/viewers with an intimate view of the poet performing her poem in the space and place it addresses. For example, award-winning poet Natasha Trethewey reads �Elegy for the Native Guard,� a poem about a Gulf Coast island�s Civil War memorial that forgets the service of African American soldiers. She leads her viewers through that space of Ship Island , showing the readers where the Daughters of the Revolution whitewashed the historical marker and where Hurricane Camille literally washed the black soldiers� bodies out to sea. � David Wharton�s photo essay, �Roadside Architecture,� depicts the humanly-made physical landscape of functional buildings in Mississippi and other parts of the deep South. He shows that buildings constructed for practical uses are often imbued with unintended beauty. His photographs demonstrate the way that this unexpected aesthetic beauty coexists with functionality within such structures as agricultural buildings and churches. In that merging of the practical and the beautiful, Wharton finds an almost Emersonian correspondence of principle and form. Southern Spaces, as a new digital environment for humanities and social science research, endeavors to transform the intellectual landscape in provocative ways. Adding to the ensuing hum of activities in digital library initiatives, digital history centers, and various individual ventures into internet publishing, Southern Spaces works to open the space of scholarly communication while challenging traditional venues of academic scholarship through its multimedia format and open-access distribution model. The internet provides a limited source for locating course syllabi, blogs and discussion boards. For every syllabus posted on the internet, dozens remain hidden on closed institutional servers and networks. Southern Spaces web-usage statistics indicate that Southern Spaces articles have been used in higher education courses at Stanford and University of Southern California , among others, few syllabi specifically assigning Southern Spaces exist online. Therefore, the Southern Spaces staff performed an informal survey of Editorial Board, Editorial Reviewers and affiliated faculty in order to gain examples of classroom uses for the online journal. After reviewing Southern Spaces-related presentations and readings with various faculty, we chose three examples of assignments employing the internet journal. Currently, uses for Southern Spaces within the classroom are two-pronged and are either based primarily on the content or the format. First, instructors use selected content from the journal as the foundation for instruction and classroom discussion relating to specific topics within the fields of Southern Studies, American History, Literature, etc. Second, instructors use selected content from Southern Spaces as a foundation for discussions regarding the format of the journal itself. In these examples, the medium of Southern Spaces rather than its content provides examples of how individuals are using new media in their scholarship. I will begin discussion of pedagogical implications for the journal with an example of this latter use. Because Southern Spaces has endeavored to set itself apart from text-based online journals in the realm of digital publication (with success so far) it provides a unique example for peer-reviewed online scholarship. Professors often employ the journal itself, as well as its contents, as an object of study. In particular, classes engaged with topics of new media have cited Southern Spaces for examples of how incorporate new media into traditional scholarship. In �Comparative Studies in Emerging Media,� a graduate course in the Moving Image Studies program at Georgia State University, three Southern Spaces pieces provided examples of alternatives to traditional print publications ( S Zebulon Baker , �Whatwuzit? : The 1996 Atlanta Summer Olympics Reconsidered;� Chuck Leavell, �Family Forestry in Twiggs County, Georgia / Live in Macon at the Douglass Theatre;� Honor�e Fanonne Jeffers, �Tuscaloosa: Riversong�). These pieces were selected to illustrate how the online medium influences scholarly content and to discuss advantages for translating traditional forms of scholarship into open-access online environments. The course�s instructor, Prof. Ted Friedman, saw the Southern Spaces presentation in the course as beneficial, particularly for junior scholars relatively new to the scholarly publishing realm: "It really opened up my graduate students' eyes to the possibilities of multimedia scholarship." The dozen graduate students (from communications and education departments) appeared to be impressed by the creativity and dynamic structure of Southern Spaces pieces, voicing an interest in examining Southern Spaces and other web-based journals as potential sites for their own research. [Assignment 1] Please look at the journal, Southern Spaces: (http://www.southernspaces.org/) by navigating through the Southern Spaces website and reviewing 2-3 self-selected pieces. [Assignment 2] Produce a creative work which experiments with new media forms. The project can be a short film, a screenplay, or a multimedia work. When submitting the final version, include a 3-page essay relating your work to ideas from the class. To encourage his students to think creatively about scholarly communication as well as their own publications, Prof. Friedman offered students the option of a �creative project� due at the end of the semester. Two students produced short videos, comparable to �Tuscaloosa: Riversong� in terms of time length and su Angle Professor in the Humanities at the University of Nebraska Lincoln , developed a writing assignment for his course on the U.S. South using Southern Spaces. Prof. Thomas asked the forty students taking the upper-level undergraduate course in Spring 2006 to write an analytical review of one of the twelve pieces then listed in the events and conferences section. [Assignment] Third Review Essay: Review of Southern Spaces (www.southernspaces.org) Event-- (http://www.southernspaces.org/con_eve_con.htm) pick one of the events/conferences and write an analytical review with reference to 3 other readings/documents in this course. While Prof. Thomas has used Southern Spaces in other courses, this assignment in particular was added for the Spring 2006 U.S. South course. After the course concluded, Prof. Thomas surmised the benefits of the assignment in addition to using Southern Spaces in the classroom. The essays were very good and made students think about the current South and the meaning of history for different southerners. I consider it a real success. We had no technical difficulty. Everyone was able to view the lectures in chunks, and they watched them in detail, took notes, and clearly really thought about what they were saying. This was the third review essay after one on a book and one on a film. All of them required an integration of primary source and secondary readings. So for example on Lacy quite a few used Anne Moody�s Coming of Age in Mississippi and Barbara Fields� essay, �Ideology and Race in American History� as well as primary sources to evaluate/discuss Lacy's thesis. It was really interesting for them. The theoretical effect of this assignment is important to consider: by asking University of Nebraska students to analyze video content published in an online essay and refer to three other course texts, Prof. Thomas encourages his students to develop their analytical skills across media formats. While many students taking a traditional Southern History course learn how to read and analyze print publications, adding Southern Spaces to the classroom encourages students to exercise their analytical skills regarding visual media and online content. This incorporation of new media into a traditional subject area is especially important at this time as more members of the technologically-enamored �millennial� generation take their seats in the college classroom (see also Center for Digital Education, 2004). [Assignment] Please read the following text which is the part of a larger essay that focuses on facts surrounding actions by the FCC and the courts in the famous case regarding Jackson Mississippi�s TV broadcast station, WLBT. Questions on this text and policy involved are presented below the essay material: For your information the full body of the essay of this material is found at http://www.southernspaces.org/contents/2004/thomas/4g.htm Additionally you may well find it necessary to use the web to find additional information on the WLBT case and that you should do to possibly earn strong scores! As with Prof. Thomas� assignment, the instructor asked students to find additional resources, however in this instance, they are challenged to exercise their research practices and �use the web� to find added information regarding this historic case. Although the assignment targets young scholars at different educational levels with different interests, all share at least one foundational principle: students can benefit analytically from reviewing selected Southern Spaces articles, and this exposure can either impact the way they view academic scholarship or even change they way they view their own scholarship. Whether in a New Media, a Southern History or a Telecommunication Policy syllabus, Southern Spaces can serve instructors and students by providing material as well as insight for reading assignments, writing exercises or final projects. With the growing popularity of electronic and internet-based resources, instructors and institutions endeavor to integrate cyberspace and the classroom. Some of the most notable attempts have taken place within the History field, but Sociology, Literature, Rhetoric and Economics have also seen substantial pedagogical growth online. While one of the most obvious applications of Southern Spaces is in the virtual classroom provided by online courses and remote teaching, new pedagogical concepts like the inverted classroom work to combine online time and face-to-face interaction. This section will review selected studies from the growing literature on new technology and new teaching philosophies. �The Internet and the Inverted Classroom� (Lage and Platt, 1999) made a mark on the learning landscape a few years ago by encouraging the use of a divided course website broken into online lectures, bulletin boards, student materials and gradebook, and a library featuring resources for self-directed study. Built to mirror four real-world spaces�the classroom, the coffee shop, the desk and the library�the Inverted Classroom concept is now popularized through web-based commercial online systems like WebCT and Blackboard. Nonetheless, the core concept of providing lecture materials in an interactive format online and saving undergraduate class meetings chiefly for group problem solving, discussion and experiments remains somewhat elusive. Although Southern Spaces does not contain a discussion board or gradebook, the site does allow for a more mobile, dynamic classroom experience. Through book and poetry readings, conference presentations and musical performances, Southern Spaces not only offers online lectures and primary resources, but does so by also integrating text and web-based sources into one online freely-accessible space. Rather than offering something akin to an instructor podcast or taped lecture, Southern Spaces articles often go beyond the podium and the video camera by adding supplementary materials such as field footage, maps and outside data. One example, Mary Odem�s lecture �Global Lives, Local Struggles: Latin American Immigrants in Atlanta,� was built from a conference presentation as she and a Southern Spaces videographer crafted a piece featuring documentary footage as well as visual data difficult to present on an overhead projector (let alone a video of an overhead projector). Similarly, Honor�e Fanonne Jeffers� �Tuscaloosa: Riversong� not only offers a short film of the author reading her poem, but also features two talks by Jeffers about writing �Tuscaloosa: Riversong� and her use or river imagery. Through on-site tapings, field footage and cooperative editing sessions, Southern Spaces offers a dynamic content portal that not only offers students chances to view lectures anywhere with an internet connection, but provides valuable material in a style impossible to replicate live in the classroom environment. Southern Spaces� dynamic use of the medium to present a more innovative lecture offers one significant reason for either bringing web resources into the classroom or bringing the online classroom into the dorm room. However, the journal�s place within the library offers another teaching opportunity and another challenge. While Southern Spaces is not a traditional archive (or a �traditional digital archive�), it complements many existing digital repositories, both within the wider cultural studies realm and the history field. At present, work within Digital History projects, programs and centers represent much of the effort to bring historical resources to an online user. Primary sources such as documents, images, footage and personal accounts are now available to the teacher and learner online because of large government endeavors like The Library of Congress� �American Memory� web portal and numerous university-housed projects like �Valley of the Shadow,� �Documenting the American South,� �Virtual Jamestown� and the �Hurricane Katrina Digital Memory Bank.� The relatively low economic barrier to putting resources online has contributed to this proliferation in historical resources. However, this low threshold also challenges the instructor and the student to evaluate the worth and validity of every site encountered. Canadian researchers found that individuals evaluate the �quality� of a website within a fraction of a second and based on its aesthetic appeal. However, fully evaluating the content of any website would take considerably more time to process (�First Impressions Count for Web�, 2006). While we cannot correct such user practices, Southern Spaces seeks to demonstrate the quality of its contents by conducting strict peer review for its submissions, and directly states that its contents have been subjected to this level of scholarly vetting on its home page. Yet, although this peer-review offers piece-of-mind to contributors and users, one of Southern Spaces chief endeavors to add to its quality is working to make findability a chief priority. While a website�s search and browsability may not strike many instructors or researchers as a key evaluating concept, the ability for many types of users to locate content on the site significantly impacts the learning experience in addition to increasing the findability of content not only on the site, but also in library catalogues as well as internet search engines. Engaging with work by Peter Morville in its operating philosophy and offering four browsing schemes for its content and a dynamic search tool, Southern Spaces differs from both traditional journals and hardbound archived collections. An eighteen-month cataloging process has further provided Southern Spaces with metadata for library catalogs. Although Southern Spaces lacks extensive online archives of historical resources, its gateways and essays often include primary sources either in the piece, in hyperlinks or in recommended resources section. This publishing model provides an accessible organizational framework easy to navigate as well as search through. This allows instructors ease-of-use in finding relevant materials for course sites, syllabi and lectures; and it provides a helpful resource to young researchers, just learning how to effectively use technology for their own scholarly interests. As of June 2006, Southern Spaces will also begin discussion regarding the creation of a supplementary archive featuring video footage, original images and historical documents from selected Southern Spaces articles. The intention of this aim is to produce yet another searchable repository on Southern Spaces servers for interested teachers, students and researchers. As an internet-based interdisciplinary journal, Southern Spaces combines subject matter covering fields of inquiry over a host of media and formats. Although the journal focuses on spatiality and the American South, the Editorial Board and staff endeavor to bring content applicable to courses focusing on American Literature and History, as well as Arts, Music, Media Studies, Economics, Environmental Studies, Social Policy, Education, Religion, Race and Ethnicity Studies, Gender and Sexuality Studies, Government Policy, Leisure Studies and Geography. With over fifty pieces published since 2004 and nearly twenty pieces in progress, Southern Spaces presents multiple fields of humanistic inquiry through new media applications. In this case study, we have introduced Southern Spaces as well as offered insight into its development, uses and future goals. We argue that Southern Spaces provides a forum for innovative scholarship by taking advantage of the internet's capabilities to deliver audio, video, interactive imagery, and text in a rapid and timely fashion while also facilitating new ways of organizing, presenting, and updating research. By providing permanent URLs and electronic archiving for published materials, Southern Spaces makes a commitment to a stable digital presence for scholarly endeavors, both research and pedagogically related. The vast majority of the Editorial Board and the Editorial Reviewers are instructors in North America and Europe and seek to not only provide an innovative site for multimedia publication, but also to publish pieces that will bring technology into the classroom, the library, the dorm room and the home of the independent learner. Although Southern Spaces is not the bridge in the digital divide between new media and traditional modes of scholarly inquiry, it does present a bridge, offering interdisciplinary scholarship to a large audience of potential students and instructors. Bruckman, Amy S. (2005). Student Research and the Internet. Communications of the ACM, 48:12, 35-37. Chavez, Hernan, et.al. (2002). Applications of Internet to Teaching-Learninga Anne. (2004). Internet Review: Educator Concerns Regarding Cyberspace Curricula. Education, 125:1, 15-19. DigiRhet.org. (2006) Teaching Digital Rhetoric: Community, Critical Engagement, and Application. Pedagogy: Critical Approaches to Teaching Literature, Language, Composition, and Culture. 6:2, 231-259. Dyson, Rick. (2004). The Civil War on the Internet: A Selection of the Best Web Sources for Educators and Students. The Social Studies, 211-216. �First Impressions Count for Web.� (2006). BBC News International Version. Retreived May 28, 2006, from http://news.bbc.co.uk/2/hi/technology/4616700.stm. Foertsch, Jacqueline. (2006). Books as Broccoli? Images as Ice Cream? Providing a Healthy Menu in a College English Classroom. Pedagogy: Critical Approaches to Teaching Literature, Language, Composition and Culture, 6:2, 209-230. Frankel, Noralee & Shapiro, Linn. (1999). A Collaboration of Two- and Four-Year Colleges: Reconceptualizing the Introductory Survey Course. The History Teacher, 33:1, 91-95. Glahn, Ronald & Gen, Raymond. (2002). Progenies in Education: The Evolution of Internet Teaching. Community College Journal of Research and Practice, 26, 777-785. Gordon, Michael S. & Rosenblum, Lawrence D. (2001). Audiovisual Speech Web-Lab:An Internet Teaching and Research Laboratory. Behavior Research Methods, Instruments and Computers, 33, 267-269. Jaffee, David. (2003). Virtual Transformation: Web-Based Technology and Pedagogical Change. Teaching Sociology, 31:2, 227-236. Jaschik, Scott. (2006). A Tenure Reform Plan With Legs. Inside Higher Ed. Retreived May 28, 2006 from http://www.insidehighered.com/news/2006/01/05/tenure. Kilgore, Susan. (2004). Bridges from Content Experts to novice Learners in 21st-Century Classrooms. Rocky Mountain Review of Language and Literature, 58:2, 63-70. Lage, Maureen J. & Platt, Glenn. (1999). The Internet and the Inverted Classroom. Journal of Economic Education, 31:1, 11. Liu, Meng-chun & San, Gee. (2006). Social Learning and Digital Divides: A Case Study of Internet Technology Diffusion. KYKLOS, 59:2, 307-321. Morgan, Konrad, et. al. (2000). Psychological Developments in High Technology Teaching and Learning Environments. British Journal of Educational Technology, 31:1, 71-79. Morville, Peter. (2005). Ambient Findability: What We Find Changes Who We Become. Cambridge , MA : O'Reilly Media, Inc.
Natriello, Gary. (2001). Bridging the Second Digital Divide: What Can Sociologists of Education Contribute? Sociology of Education, 74:3, 260-265. Noonan, Kathleen. (1998). Untangling the Web: The Use of the World Wide Web as a Pedagogical Tool in History Courses. The History Teacher, 31:2, 205-219. Nystrom, Elsa A. and John B. (2005). Beyond the Valley of the Shadow: Taking Stock of the Virginia Center for Digital History. JOLT, 1:1. Retrieved April 18, 2006, from http://jolt.merlot.org/vol1_no1_nystrom.htm. Oliver, Martin. (2000) Evaluating Online Teaching and Learning. Information Services and Use, 20, 83-94. Penuel, William R. (2006). Implementation and Effects of One-to-One Computing Initiatives: A Research Synthesis. Journal of Research on Technology in Education, 38:3, 329-348. Pomerantz, Linda. (2001). Bridging the Digital Divide: Reflections on �Teaching and Learning in the Digital Age.� The History Teacher, 33:4, 509-521. Ringrose, Daniel. Beyond Amusement: Reflections on Multimedia, Pedagogy, and Digital Literacy in the History Seminar. The History Teacher, 34:2, 209-228. Schwartzman, Roy. (2006). Virtual Group Problem Solving in the Basic Communication Course: Lessons for Online Learning. Journal of Institutional Psychology, 33:1, 3-14. Smith, Stephen M. & Woody, Paul C. Interactive Effect of Multimedia Instruction and Learning Styles. Teaching of Psychology, 27:3, 220-223.